Led by the City of Texarkana, Texas (pop 37,000), the urban regeneration for a key downtown block creates an activity node connecting City Hall, the Regional Arts Center, and the magnificent 1400-seat Perot Theatre—all elegant pre-1920s buildings that do not front the park. Currently a surface parking lot, this activity node will function as a social condenser to catalyze further investment in a downtown that is regaining some of its residential population lost over the last half century. Through the use of townscaping elements, the design creates a new urban living room for a downtown on the cusp of regeneration. 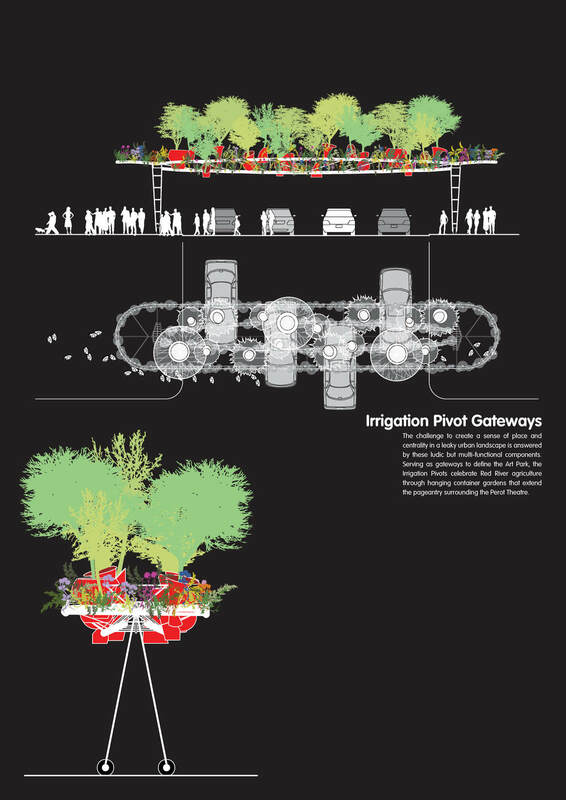 The design proposal consists of four key components, a farmer’s market, bandshell and amphitheater, art walk, and gateways. 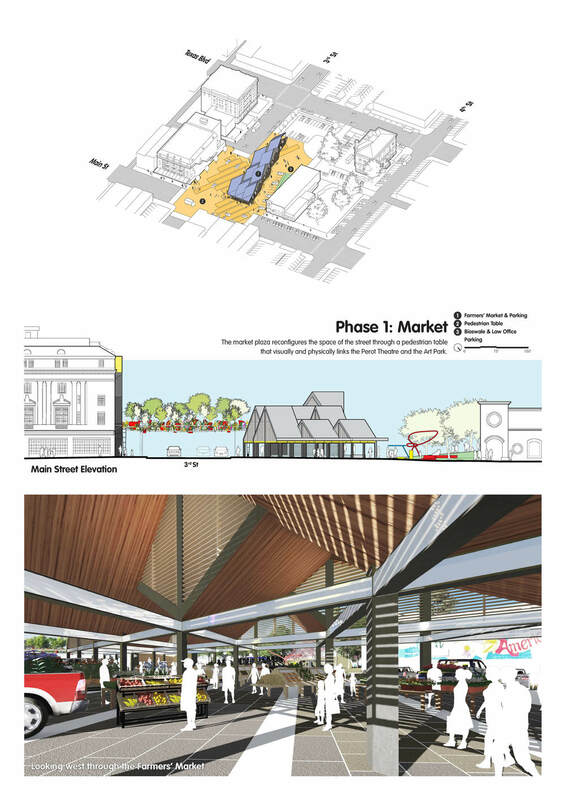 The farmers’ market will serve a thriving local food economy and double as covered parking for theater patrons in the evenings. The bandshell and amphitheater introduce outdoor performance events to downtown and also house an art gallery and public restrooms below. 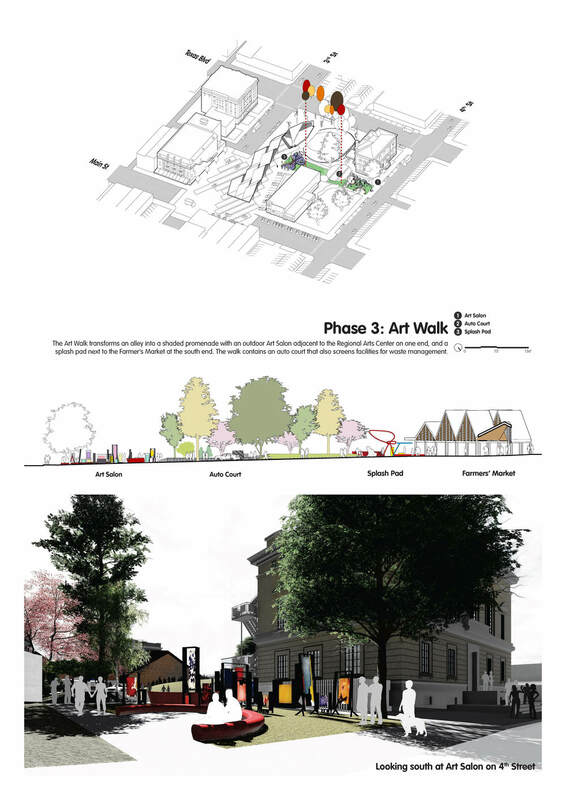 The art walk transforms an existing alley into an illuminated and shaded allee with freestanding vitrines for showcasing artworks while also accommodating a splashpad. The four components extend the social life of adjoining cultural venues like the magnificent Perot Theatre. Here, infrastructural space and components—usually thought of as supplemental to the city—are artistically reconsidered in reshaping the city.